My RetroMatic 2000 project has two halves – so far I’ve been working on the first half: a module that converts a weird video signal from a 1980s computer to clean VGA. Before starting work on the second half (a floppy drive emulator to load software onto these machines), I’ve been having a think about the final aesthetics of my project. 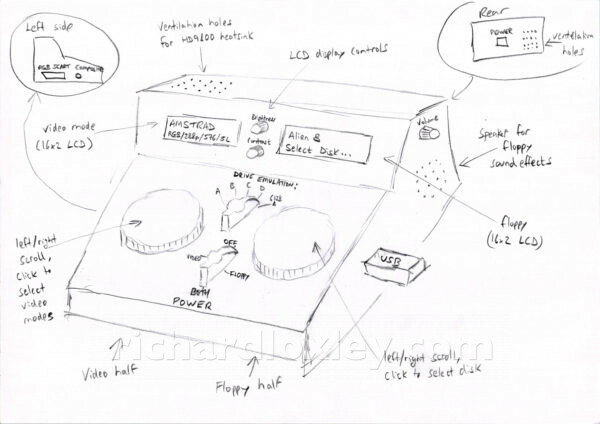 I wanted some kind of smart box to house the video board, preferably with ventilation slots as the heatsink on the video chip gets very hot. And I needed places for all the video sockets, and some switches to control it. 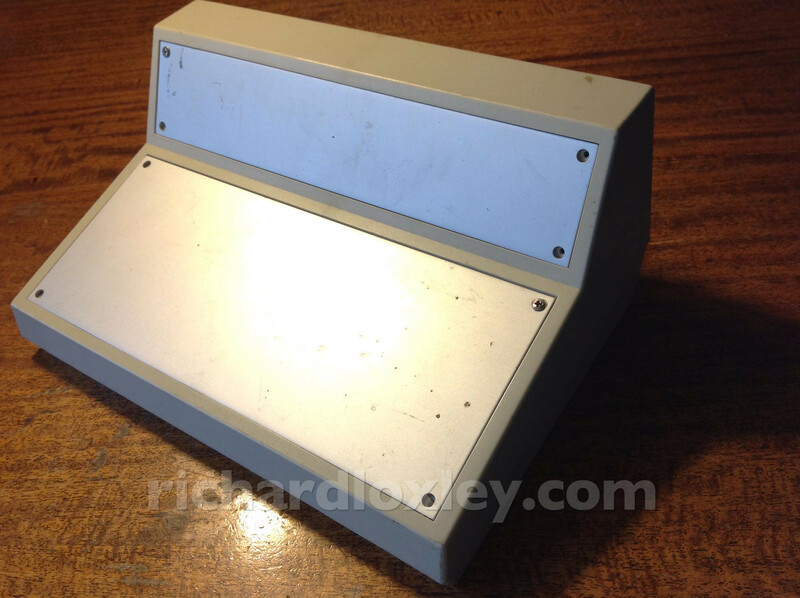 I’ve also been wondering whether to build the SD card floppy drive emulator (HxC) into the same case. The pros for all-in-one are: they can share the same power supply; the bare-board HxC is available with different colour LCD displays, and the green display looks way more retro than the blue one supplied with the cased model; the Amstrad 464 requires a different configuration of pins on the floppy cable, so being in a case allows for a neat solution to switch the pins; the uncased HxC was £17 cheaper, but now the prices have gone up due to exchange rate fluctuations, but I can get the bare board at the old price, making it £25 cheaper – £25 is a lot for a plastic case (albeit a very well designed custom case)! The cons for an all-in-one: need to find a decent case that works for both applications; more work to get it right (external buttons, slot for the SD card, hole for the display, etc); can’t use them independently. Although the only time I might want to use them independently is with the new TRS-80 as that’s too big to store it with the other computers. And I’m not 100% sure I can use the HxC with it – apparently you need to disconnect the internal drives and re-route the internal floppy cabling as it has no external drive port. In the end I decided to wait and see what cases were available, and then decide based on practicality. I should be able to get both the video board and the HxC in it, and the case would lend itself nicely to the floppy drive LCD display on the vertical surface and all the buttons and switches on the sloping surface. Ports can go round the back, SD card slot possibly on the side. I’ll have to drill some ventilation holes: probably a load on the bottom, and some high up on the back. With the size of the box, I think it lends itself well to having both the video converter and the floppy emulator in the same box. So decision made! So here’s my latest purchase: a pair of 1602 LCD displays, and a bunch of rotary encoders (left/right/click) to control the menus. 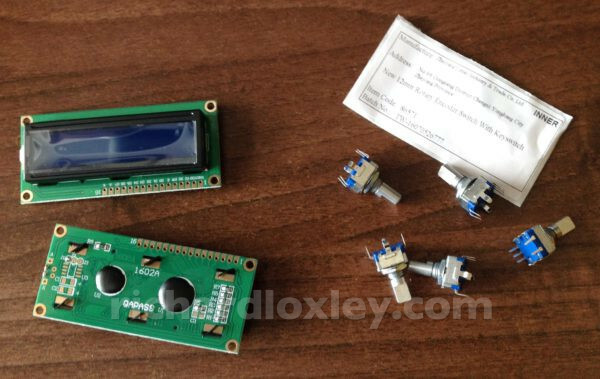 I’ve used rotary encoders before on an ESP8266 project, so I’m fairly comfortable with them, although I’m not familiar with the Arduino interrupt model, so I might need to adjust my routines to suit. The LCDs I bought are blue, but I rather fancied green on black, to emulate the aesthetic of a green screen monitor. So I also ordered a pair of green ones from China, but they’ll take a couple of months to arrive, so the blue ones will be a stopgap. 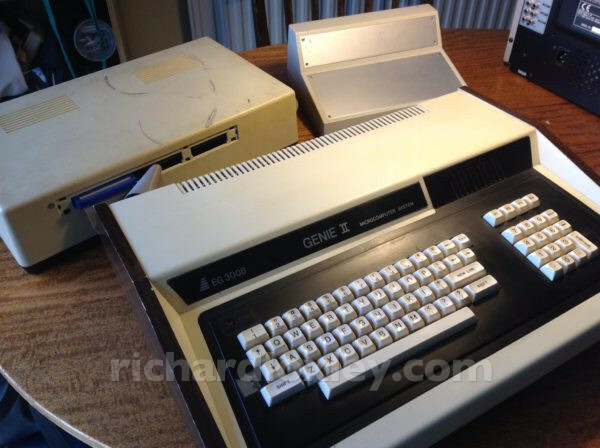 This entry was posted in Retro computing and tagged rc201704, retrochallenge on 3 April 2017 by Richard.